The above info came from Antony, and was edited by yours truly (contact me). The image came from Naruto Fan Image Gallery. Orochimaru was of the legendary Sanin, the three students of the Third Hokage himself who gained their name by standing their ground against Hanzo. However, desiring to know all of the world's justsu, Orochimaru had been conducting experiments on various people to find the means to be immortal, all the while hoping to become Fourth Hokage. However, when the Third Hokage named his successor Minato Namikaze, Orochimaru deliberately had the [3rd_hokage|Third Hokage]] find out about his work before leaving the village. At that time, while researching the genetic makeup of Jugo, Orochimaru developed the Cursed Seal from Juugo's enzymes, with his pupil Anko Mitarashi being one of the first successful experiments. Upon joining the S-rank criminal organization known as the Akatsuki, Orochimaru perfected his immortality Jutsu, and intended to use Itachi as his first "new container", with knowledge of the Sharingan's full power. But Itachi countered the attempt, forcing Orochimaru to retreat. Eventually finding the Village Hidden in Sound, Orochimaru used his Immortal Jutsu, transforming himself into a mass of snakes that enter a human body and devour the host's soul to gain total control, using masks of his original face to conceal the truth of his "immortality". While in the body of a young woman, Orochimaru learned of Sasuke's existence during the Chunin Exams. Orochimaru chose to place his mark on Sasuke before leaving to set up his false alliance with the Village Hidden in the Sand to destroy Konoha. However, on the day the Invasion was carried out, Orochimaru, Kabuto, and Kimimaro murders the Fourth Kazekage, and Orochimaru takes his place at the chuunin matches to get close to the [3rd_hokage|Third Hokage]] for an assasination attempt. However, after revealing that his true intent for the invasion was to capture Sasuke, the [3rd_hokage|Third Hokage]] sacrificed himself to leave Orochimaru unable to do any Jutsu. After a vain attempt to have Tsunade heal him, Orochi sends his Sound Ninja Five (Jirobu, Kidomaru, Tayuya, Sakon, and Ukon) to retrieve Sasuke to begin the transfer. But this is not to be, as eventually Orochimaru can wait no longer and takes the body of a young man instead. But this gives Orochi time to condition Sasuke until he is able to transfer his being again. Unfortunately for Orochi, by that time Sasuke turns the tables and temporary seals Orochimaru inside his body. But during the fight with Itachi, Orochimaru breaks free, with Itachi sealing him away with a genjustsu before the serpent could take over Sasuke's body. But is that truly the end of Orochimaru? In the aftermath of the Sasuke/Orochimaru fight, Kabuto, Orochimaru's most loyal henchman whom he used since he was just a child, injected some of cells from Orochimaru's remains in order to become even greater. 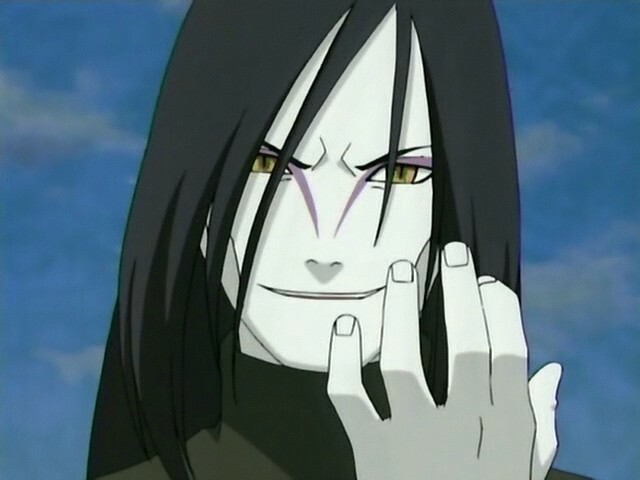 But, Orochimaru's influence is taking control of him at a slow but sure rate. Like Jiraiya, Orochimaru can also do Summoning No Jutsu, but instead of summoning Toads. The above description came from Antony, Brandon Stehmeier, Velvet_tears, and mizuki_dx, and was edited by yours truly (contact me).